To complement her culinary expertise, Nicole has studied wine on a professional level, and holds certifications from the International Sommelier Guild and the Wine & Spirit Education Trust. Nicole’s passion for wellness extends into the fitness arena. She received full certification as a Pilates Trainer from Pilates Master Ellie Herman and is certified to teach yoga through The Mindful Body of San Francisco. She has over 12 years of combined experience teaching yoga and Pilates to private clients and group classes. As a chef, Nicole draws inspiration from her combination of experience in food, nutrition, fitness and travel to provide clients with healthy, innovative meal options with a focus on wellness. She is founder of A Moveable Feast By Nicole, which provides personal chef services that include culinary instruction for adults and teenagers, prepared meal delivery, cooking for private clients, national and international retreats and result-driven cleanses. 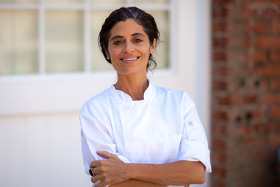 Nicole was one of the original chefs on board with Munchery, an online meal delivery service in the Bay Area; she developed and ran the culinary program for Destination Detox in Hudson, New York and Todos Santos, Mexico; and for several years she was a culinary instructor for Sur La Table. Today Chef Nicole can often be found leading events throughout the Bay Area for Parties That Cook, a hands-on mobile cooking party company that emphasizes team-building; working with teenagers on a healthy cooking and nutrition class series; and studying for a Master of Science in Holistic Nutrition which she is pursuing through Hawthorn University. She intends to continue to educate people on the benefits of nourishing foods and nutrition and the positive impact they have on lifestyle.